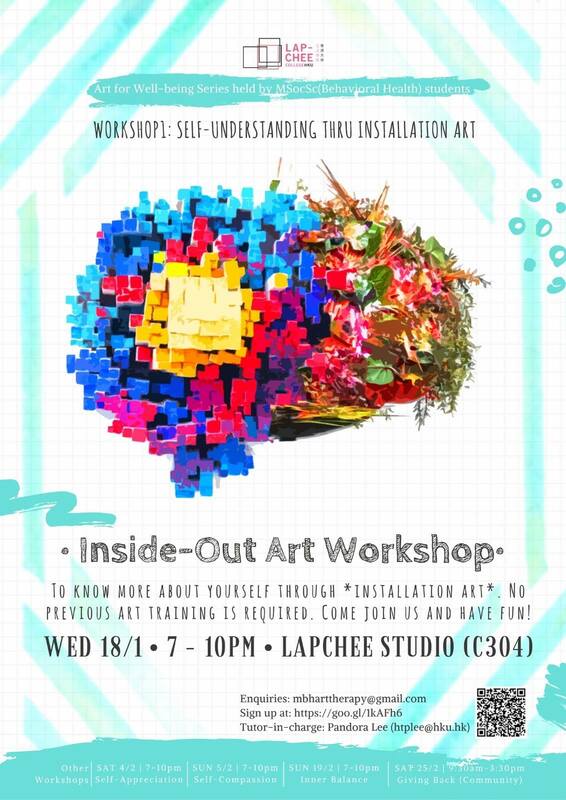 We are a group of students from the HKU MSocSc(Behavioral Health) programme and we are hosting a series of art for wellbeing workshopsfrom 18/01 to 25/02/2017 in Lap-Chee College studio (C304). Unlike art skill classes, this series of art for wellbeing workshops aims topromote self-exploration and self-expression via different kinds of art and mindfulness activities. Thus the aesthetic quality of the product is not the focus and a non-judgmental attitude is emphasised throughout. There are only 30 quotas for each workshop, so sign up ASAP. You may sign up more than one workshops (the more the merrier!). We will send confirmation emails one week before the workshop date for successful applicants. No previous art training is required. Come join us and immerse in the creative process! Wish you all a Happy New Year! We look forward to meeting you in 2017!